Cinnamon buns and sticky buns are both types of buns that are made from sweet, yeast dough. They are often considered very similar and they are often eaten in similar ways. However, they are made by following very different recipes, so they are not interchangeable. Some people prefer one type of bun over another. Cinnamon buns and sticky buns are both prepared from sweet yeast dough. In order to prepare cinnamon buns, the dough is rolled out and then sprinkled with cinnamon and sugar. The dough is then rolled up and baked. Once the buns have been baked, they are iced with white icing. Sticky buns are also made from sweet yeast dough, but they are prepared in a very different way than cinnamon buns. In order to make sticky buns, the dough is rolled out and stretched by hand in order to create layers that are much thinner than those which are used to make cinnamon buns. Melted butter is spread across the layer of very thin dough, along with cinnamon, sugar and often with chopped fruits such as raisin or currants. Once the filling has been added, the dough is rolled up and then cut into sections. These rolls are baked together into a loaf in a pan of caramel sauce. The sauce is made from a combination of melted butter, brown sugar and chopped nuts, which are usually walnuts or pecans. The buns are flipped out of the pan immediately after they have been cooked, so that the sticky sauce can run over them and seep between the layers. 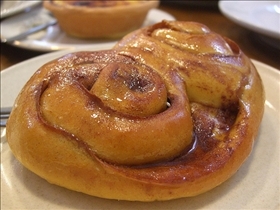 Cinnamon buns have a distinctive cinnamon flavor that blends with the sweetness of the icing. The way that cinnamon buns are made creates a number of layers of dough of different sizes that are rolled up together. The cinnamon filling is spread in between these layers. The layers are usually fairly large, although they do vary in thickness within the same cinnamon roll. Cinnamon buns are also known as cinnamon swirls or rolls because they tend to have a spiral shape because of the way that they are made. Raisins are sometimes added to cinnamon buns, which gives them a taste that is more similar to sticky buns, although without the sticky coating. Honey buns are another variation on cinnamon buns that contain a swirl of honey sandwiched in between the layers. 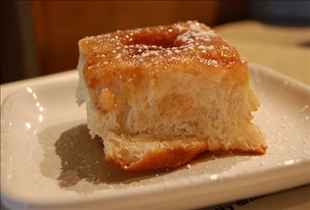 Sticky buns are made out of very thin layers of dough, which are filled with sugar and chopped fruits. This fruit filling makes sticky buns very different in taste from cinnamon buns, although both have a sweet, cinnamon flavor. Sticky buns are also covered with sticky brown sugar sauce rather than with icing, which gives them a different sort of sweetness. Sticky buns also usually have nuts in them. Sticky buns are typically served as a loaf, from which individual portions can be pulled off. Sticky buns and cinnamon buns are both commonly eaten as snacks, during coffee breaks or with afternoon tea. It is common for a selection of different buns, including both cinnamon buns and sticky buns to be offered. Cinnamon buns and sticky buns are two popular sweet snacks made from yeast dough. Although there are some similarities between the two types of buns, there are some important differences between them. Cinnamon buns are usually covered with white icing. Sticky buns are soaked in a butter and brown sugar sticky sauce. Sticky buns often contain nuts and chopped fruit. Honey buns are cinnamon buns made with a honey filling.